During the last two months I had the opportunity of performing several upgrades to SAP HANA 2.0. The process itself is quite easy but there are some important topics to review before and after the upgrade. I write this post for those of you who plan to upgrade your HANA databases to the latest available. I hope it will server you well! Check both upgrade guide and important SAP Notes. Check consistency in the current SAP HANA database. Review OS parameters and requirements for the new version. Also review the requirements related to virtualization in case your HANA is running on VMware or similar. Check current version of SAP HANA and all its components and update to the latest version of HANA 1.0 if needed. Check the current mode of the SAP HANA database and see if it is running currently as MDC. Backup of the HANA database. Both SYSTEMDB and tenants. Upgrade of both SAP HANA database and all its components to SAP HANA 2.0. Upgrade of the HANA Client used to connect to the database. Check the client of the SAP systems using the database. Upgrade HANA Studio to latest version (not mandatory but recommended). Check consistency of the database running on SAP HANA 2.0 as we did on point 2. Execute SAP HANA Mini Checks. Backup of SYSTEMDB and tenants. Technical and functional test of HANA content (calculation views, SDA, etc). Technical and functional test on the SAP systems using the HANA database. Row and column store consistency: CHECK_TABLE_CONSISTENCY procedure. Column store consistency: Python script uniqueChecker.py. Row store consistency: Python script checkRowStore.py. Persistence check: Basically check if the backups are finishing correctly. If you have a problem in the persistence pages the backups will fail. Topology consistency: This step only if your current SAP HANA database version is lower than HANA 1.0 SP08. SAP HANA Installation consistency: Use hdblcm for checking it. Check and adjust the OS parameters described in the SAP Note 2205917 – SAP HANA DB: Recommended OS settings for SLES 12 / SLES for SAP Applications 12. In that note you can find the parameters and requirements for each SLES 12 suppot package. In case your SAP HANA is running on Red Hat you can check the SAP Note SAP HANA DB: Recommended OS settings for RHEL 7. If you are running on a lower SO version consider upgrading it to one of the versions described in those SAP Notes. Basically you want to upgrade to the latest SP and Rev available for SAP HANA 1.0 and from there upgrade to SAP HANA 2.0 SP3. Please remember to update previously all the components running on your SAP HANA 1.0 database. Since a couple of years ago SAP HANA support multi-tenant container as a database mode. This means that you can have several tenant databases running in the same SAP HANA database. Instead of having an schema for each SAP system using the database you will have a standalone tenant database. The problem is that SAP HANA 2.0 only works with MDC mode so if you are still running on SDC you need to convert the database to MDC. Check and follow the steps described in the SAP Note 2372809 – Mandatory Preparation Steps for Upgrading a SAP HANA 1 to SAP HANA 2 System. For converting your HANA database from SDC to MDC use the script convertMDC.py as described in the SAP Note 2101244 – FAQ: SAP HANA Multitenant Database Containers (MDC). Not much to explain here. Just perform a database backup using your backup tool for SYSTEMDB and all the tenants running on the database server. I will recommend also performing a snapshot or clone in case you are running HANA on a virtual machine. The more the backups the better. Also backup the configuration files of the SAP HANA database just in case. The SAP Note 1642148 – FAQ: SAP HANA Database Backup & Recovery describes how to backup the configuration files. The upgrade process is super easy and it is like patching HANA to a higher Support Package. Remember to upgrade all the HANA components like AFL at the same time during this phase. You should use hdblcm/hdblcmgui/hdblcmweb for starting the upgrade process and follow the steps described there. Again, this is the easy part so don’t worry. Remember to upgrade the HANA clients use in all SAP systems, servers, applications, etc. that connect to the HANA database. Otherwise when you upgrade the database the applications won’t connect since the client need the SAP HANA 2.0 client version. 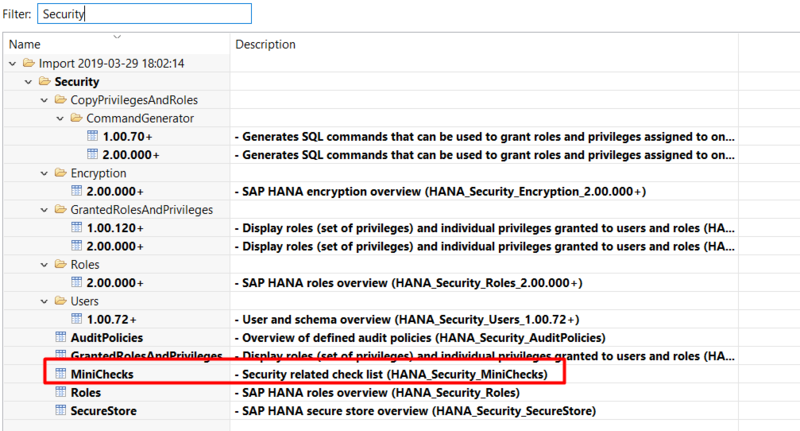 It is interesting that a lot of people doesn’t know yet about SAP HANA Mini Checks… This scripts are described and available in the SAP Note 1969700 – SQL Statement Collection for SAP HANA and they provided an incredible amount of information of our SAP HANA database. The SAP Note 1999993 – How-To: Interpreting SAP HANA Mini Check Results describes how to interpret the results of each mini check. SAP HANA Mini Checks available in SAP HANA Studio. Remember to fix any issue or problem that appears in the SAP HANA Minichecks. Developed content in the SAP HANA database as calculation views. Check also the SDA connections. Perform functional test in the SAP system using the SAP HANA database. What we want to check if the performance of the most used transactions and see if there is any problem executing them. Execute the Basis transactions in order to check if there is any problem within the system. Some of this transactions are ST22, SM21, SICK, ST04, etc. As you can see there are a lot of steps to perform before starting the SAP HANA 2.0 Upgrade but if you know what to do is easier and less time consuming. I always try to explain to my team members that it is really important to check all the guides, SAP Notes and documents related to the new version that are available in the SAP Support Portal, SAP Help Portal and SAP SCN. The SAP Basis work is not only about doing technical stuff. It is really important to read before starting to perform any technical tasks, write the documentation during the technical upgrade and to document the technical and functional test. Let me know if you have any question about the whole process, I always appreciate your comments!